I'm having trouble getting to certain pages of the site. How can I resolve this? Sometimes, a web browser may get stuck in a loop or incorrectly display a webpage because it has trouble processing the information stored in its cache, or other data (known as cookies) that it has kept. Most of the time, simply clearing the browser's cache and cookies will fix the problem. This is easy to do and it can help with page loading problems when signing in, making changes in the shopping cart, submitting a question to Customer Support, and browsing other pages on the website. For detailed instructions, please choose your browser from the list below. Click Tools at the top of your browser window. If the Tools menu is hidden, press the Alt key on your keyboard to make it appear. Un-check the box next to Preserve Favorites website data. 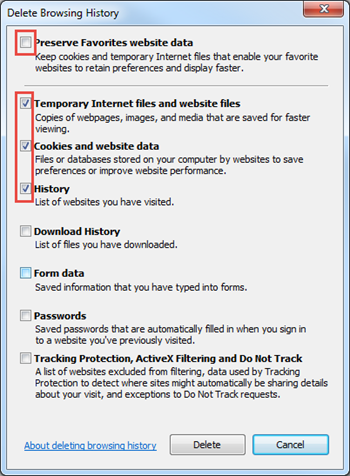 Make sure Temporary Internet Files and website files, Cookies and website data, and History are checked. Click the Firefox button in the top left of your browser window. 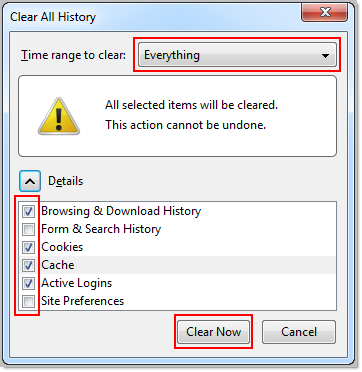 Select History, then click on Clear Recent History. Check Browsing & Download History, Cookies, Cache, and Active Logins. While in the Chrome browser, hold down the Ctrl and Shift keys on the keyboard, and press the Delete key. Check Clear browsing history, Clear download history, Empty the cache, and Delete cookies and other site and plug-in data. 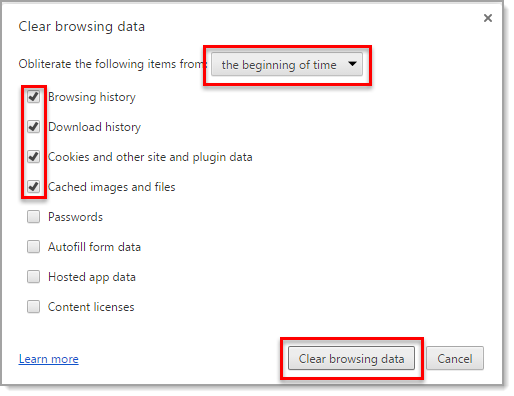 Make sure that the Obliterate the following items from: dropdown menu says the beginning of time. Click the Safari menu in the top left of your main window, then select Preferences. Click on Advanced in the upper right corner of the new window. Check the box to Show Develop menu in menu bar, then close the window. The Develop menu should now appear in the Safari menu bar. Click the Develop menu, then select Empty Caches. To find out which version of Internet Explorer or Mozilla Firefox you have, select the Help menu at the top of your browser and click on About Internet Explorer or About Firefox. The version number will be displayed. Right click on the Time/Clock in the bottom right corner of your screen, then select Adjust date/time. Make sure that the date and time settings are configured to use the current date and time. Confirm that your Time Zone is set correctly and then click OK.